Hanko is a bilingual port town and municipality on the south coast of Finland, 130km west of Helsinki. Start off your visit on the 1st (Mon): kick back and relax at Bellevue Beach, then trek along Tulliniemi Nature Path, and then take in panoramic vistas at Hanko Water Tower. To see maps, other places to visit, and other tourist information, you can read our Hanko online itinerary planner . Omaha, USA to Hanko is an approximately 16.5-hour flight. Due to the time zone difference, you'll lose 8 hours traveling from Omaha to Hanko. Plan for slightly colder temperatures traveling from Omaha in July, with highs in Hanko at 70°F and lows at 52°F. Wrap up your sightseeing on the 1st (Mon) to allow time to travel to Rauma. Rauma is a town and municipality of ca. Start off your visit on the 2nd (Tue): learn about all things military at Rauman Merimuseo - Rauma Maritime Museum, examine the collection at Marela Museum House, take an in-depth tour of The Old Town Hall Museum, look for gifts at Ruokapuoti Lumo, then take in the architecture and atmosphere at The Church of the Holy Cross, and finally get to know the fascinating history of Old Rauma. 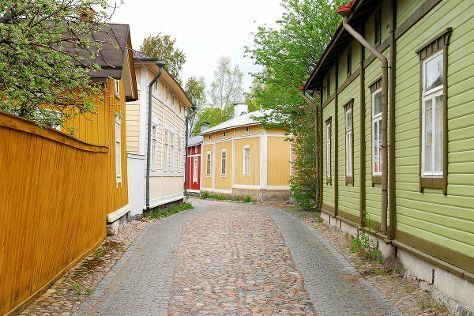 To see photos, where to stay, maps, and tourist information, use the Rauma itinerary builder . You can drive from Hanko to Rauma in 3 hours. Expect a daytime high around 69°F in July, and nighttime lows around 53°F. Finish your sightseeing early on the 2nd (Tue) to allow enough time to drive to Jyvaskyla. Jyväskylä is a city and municipality in Finland and in the western part of the Finnish Lakeland. Start off your visit on the 3rd (Wed): test your team's savvy at popular escape rooms, look for gifts at Punnitse & Saasta, then examine the collection at The Craft Museum of Finland, then learn more about the world around you at Natural History Museum of Central Finland, and finally take in the spiritual surroundings of Petajavesi Old Church. Get ready for a full day of sightseeing on the next day: explore the striking landscape of Leivonmaki National Park. To see traveler tips, ratings, more things to do, and other tourist information, refer to the Jyvaskyla trip itinerary builder site . Traveling by car from Rauma to Jyvaskyla takes 4 hours. Alternatively, you can do a combination of bus and train. July in Jyvaskyla sees daily highs of 69°F and lows of 51°F at night. Finish up your sightseeing early on the 4th (Thu) so you can go by car to Kotka. Kotka is a city and municipality of Finland.Kotka is located on the coast of the Gulf of Finland at the mouth of Kymi River and it is part of the Kymenlaakso region in southern Finland. Start off your visit on the 5th (Fri): let the kids burn off some steam at Katariina Seaside Park, then tour the pleasant surroundings at Santalahti Nature Trail, then look for all kinds of wild species at Riverside Park, and finally steep yourself in history at Kotka Church. On the 6th (Sat), you'll have a packed day of sightseeing: get to know the fascinating history of St. Nicholas Orthodox Church, take a stroll through Linden Esplanade, admire the striking features of Hamina Fortress, then make a trip to Saint Peter and Saint Paul Cathedral, and finally don't miss a visit to Hamina Town Hall. To see other places to visit, ratings, traveler tips, and more tourist information, read Kotka trip website . Traveling by car from Jyvaskyla to Kotka takes 3.5 hours. Alternatively, you can take a train; or do a combination of bus and train. July in Kotka sees daily highs of 70°F and lows of 55°F at night. Wrap up your sightseeing by early afternoon on the 6th (Sat) to allow time for travel back home.